You remember as a kid sitting around the campfire late at night, roasting marshmallows, and telling spooky stories. It was so scary because every sound you heard was the reminisce of all your greatest fears. As you tried to sleep, the campfire crackled out its eerie warning, but as you awoke to the early morning light, you knew that you had conquered all the demons that haunted your dreams …or had you??? Recently, I was able to view the film. I had heard all the hype, but I had also heard from someone whose opinion on horror I hold very high, that it wasn’t that good. So when I got the tape and popped it into the VCR, I had set my sights a little lower than all the hype and have to say I was pleasantly surprised. “The Blair Witch Project” is a really well-made scary film. There are several reasons why this film works for me. First, it is scary without the gore. The film plays more on examining the slow deterioration of the human psyche when faced with unknown terror and brings to the surface our deepest darkest primal fear, where the hunter becomes the prey. Second, “TBWP” is shot from a narrative perspective in a pseudo-documentary framework. The directors have said that the film finds its’ foundation in the lineage of such TV series as the Leonard Nimoy vehicle “In Search of“, but I would defer by citing “Cannibal Holocaust” as a possible influence. From the beginning, we are lead to believe that the footage we are watching has been recovered out of the woods and documents the final days in the lives of three student filmmakers searching for the “Blair Witch”. Never once during the film are we lead to believe that “Blair Witch” isn’t the real deal. The graininess of the footage as it dances between black, white, and color further drives home the surreal atmosphere of this terrifying ordeal. The soundtrack, which consists of a score of only the haunting sounds that inhabit the wood, is chillingly effective. Throughout the film, I continued to ask myself, “is this real?”, even though I knew it wasn’t. “The Blair Witch Project” proves that you don’t need blood, guts, or glitz, over-the-top special effects, or even a multi-million dollar budget to make a superior film. That your cast doesn’t need to be made up of rejects from “Party of Five” “Buffy” or “Beverly Hills 901–whatever” in order to make a good film. It takes the traditional Hollywood formula for horror, kicks it to the curb, and with an in-your-face guerilla filmmaking attitude asks, “are you ready to be scared?” I am not saying that “TBWP” is the second coming of “Evil Dead”, but it definitely a step in the right direction. Will it succeed??? That is entirely up to you and I. Will it changes horror??? Let’s hope, but it probably will take a lot more than “TBWP” to do that, but it’s a good start and a film we definitely need to support!!!! As these words fade silently from the screen, an uneasiness begins to settle in. Three students, Heather Donahue, Joshua Leonard, and Michael William, are heading up to Maryland’s Black Hill Forest to shoot a documentary on the local legend, “The Blair Witch”. Tales tell of a witch who was responsible for the death of many children. When the filmmakers begin interviewing the locals, they find that fears of the “Blair Witch” curse still burn deep in the psyche of this community. After leaving their car behind on the roadside, the three hike out into the woods in search of the “Blair Witch”. Along, the way they stop at “Coffin Rock” where Heather spins an eerie tale of murder and witchcraft. Now feeling that they are hot on the trail of unraveling the mystery that haunts these woods, they push on. The first night goes rather peacefully, but as the filmmakers travel deeper into the woods they could not be prepared for the terror that awaits. After a brief encounter with something the following night, they decide to pack up and head back. Seemingly lost and without their map, the tension and fear grow as they hear strange sounds haunting the woods around them. Shadows and omens warn them of their trespassing ways and that something is out there. What was supposed to be a weekend trip quickly turns into a five-day ordeal of pure terror? With a dwindling food supply, failing morale, and lack of sleep, we watch the slow deterioration of these three as they feel the darkness closing in on them. But what will the end bring?? Check it out and decide for yourself. Learn how 2 solve the Rubiks Cube with the layer method, learning only six algorithms. The film premiered at the Angelika Film Center in New York City on July 14th, 1999. It won the “Prix de la Juinesse” (audience choice) award at Canne 99. The actors carried around a global positioning satellite receiver (GPS) to let the crew know where they were in the forest and where to head for instructions and food. Heather Donahue, Joshua Leonard, and Michael Williams are the characters’ and the actors’ real names. The actors were given a HI8 and 16mm and send out into the wood for eight days to shot the film. The only contact that they had with the crew was through notes and minimal rations left for them to pick up daily. Over 18 hours of raw footage was generated from the excursion in the woods. “The Blair Witch Project” was the first film that was picked up at Sundance. Artisan signed the deal for $1-2 million and also offered a summer release. Near the end of the eight-day shoot when the characters in the film were running low on food, the crew also cut back on the actors’ rations for the day. The actor’s actually had to agree (it was written into their contract) that they could be messed with psychologically. The wood location for “TBWP” was Seneca Creek State Park in Maryland. The film was shot in October 1997 and the directors spend more than a year editing the film down the final product. An alternative ending was shot for Artisan, but the studio left the decision as to which end to use to the filmmakers, so they went with their original ending. Maybe we will see this and some of the deleted scenes on the DVD release. The sequel “Blair Witch 2: Book of Shadows” wasn’t really that bad, because the filmmakers took chances and weren’t looking to cash in on the traditional clich?s. This is probably why it bombed in the theaters because everyone was hoping rehashed “Blair Witch” and it wasn’t. I applaud them for that. 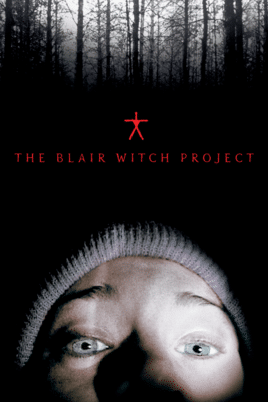 Order the DVD of the “The Blair Witch Project” at Amazon.com. Order the video of “The Blair Witch Project” at Amazon.com. Order the DVD of the “Blair Witch 2: Book of Shadows” at Amazon.com. Order THE BLAIR WITCH PROJECT book at Amazon.com. Visit the Official Blair Witch Project Website. In 1785, in the Maryland township of Blair, a woman named Elly Kedward was accused of luring children into her home to draw blood from them. The town found her guilty of witchcraft and banished her during a particularly harsh winter. A year later, all her accusers and half the children of the town vanished. Fears of a curse gripped the townspeople, and they abandoned Blair. Thirty-eight years later, Burkittsville was founded on the former site of Blair. In 1886, an eight-year-old was reported missing. Search parties were dispatched, one did not come back. Their bodies were found at Coffin Rock, tied and disemboweled. Beginning in 1940, seven children were abducted near Burkittsville over the course of seven months. In May of 1941, an old hermit publicly proclaimed that he was “finally finished.” Police investigated his secluded home in the woods, where they found the bodies of the seven children ritualistically murdered and disemboweled. The hermit confessed to the atrocity and claimed that he did it for an “old woman ghost” who lived in the woods. In 1994, three college students doing a project on the Blair Witch ventured to the town to interview the locals. They vanished at the site of Coffin Rock, and 1 year later, their footage (cans of film, DAT tapes, video cassettes, a journal, and 10 HI8 tapes) was found. Filmmakers examined the footage and attempted to piece together the events that led to their disappearance.